The Tube Ribbon is one of the first of its kind. 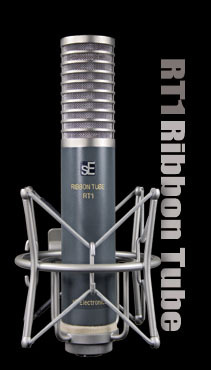 Launched in early 2006 as a prototype it was the world’s first Ribbon mic with a tube. It builds on the hugely successful sE Ribbon, considered one of the best mics in it’s class, and used in Pro Studios the world over, but adds a silky warmth to the ‘standard’ sE Ribbon sound. It ships with full shock mount and black Aluminium flight case and sE mic cable and also comes with a limited 10 year capsule replacement warranty. The RT1 is ideally suited to recording electric guitar cabs, overhead drum mic-ing, brass and woodwind instruments, string sections and for commercial broadcast and voice-over.